I remember the dark and the quiet, the country roads, the back roads, those long stretches where the only light comes from the occasional set of headlights coming toward you in the distance. In these places there are no streetlights. Though the landfill is lit up some, and the Farmer’s Market looks decorated for Christmas, but these, like the drive home from Palgong Mountain at night, are exceptions. 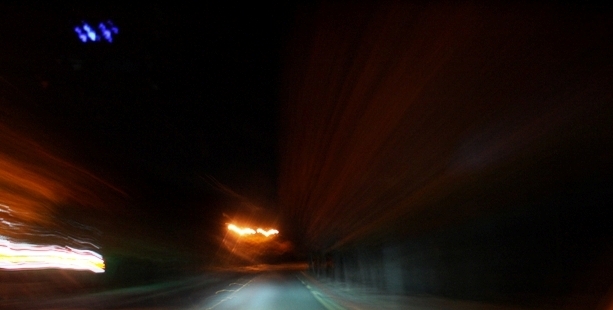 I had forgotten about this, forgotten how peaceful driving home at night on those roads can be, forgotten how lonely they can make you feel, forgotten how if you’re not careful you could almost fall asleep while driving, lost somewhere in the middle of what seems like an endless road to nowhere. And I’d forgotten that nowhere is usually where you end up. Or maybe I was always wrong about that. Look where I am. I remember too the sound of a train rumbling down the tracks through the night – always through, never during. Those trains broke the night in half, not with their speed but with their magnitude. I have yet to see, let alone hear, a train in Korea with such presence and power. And now as I lay in my dark and quiet room I miss the sound of trains, the warning lights, flashing, as the arm comes down, even the waiting. As I sat in the passenger seat of my co-worker’s car, I tried to capture the darkness. It was too dark. We drove on for some time before we reached the city, even before we came across another car. There were no street lights, only the outline of the mountain. I needed some light – some sound, perhaps – and I got it, but I still wasn’t able to capture what I remember. The day turned out to be what I would call pleasant. 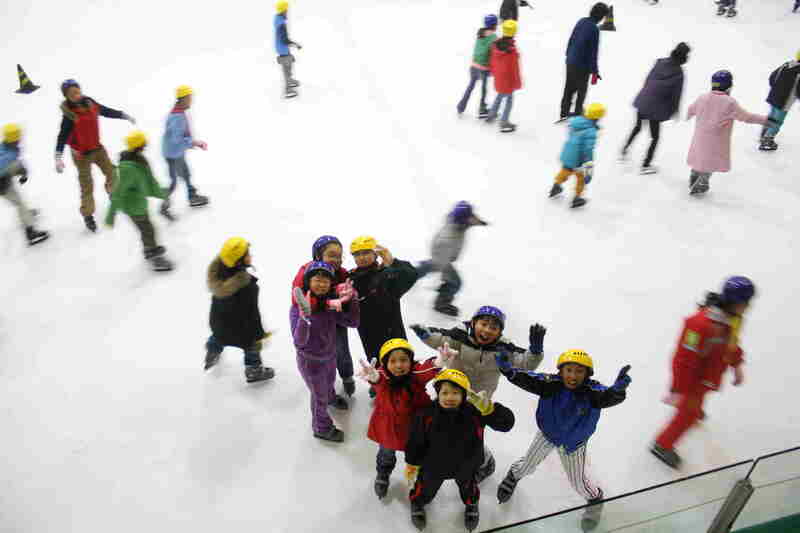 I went ice skating with the fourth grade, hundreds of kids, I don’t know for sure how many, dressed in gloves, mittens, hats, coats, dressed as polar bears. We walked in long lines for about for thirty minutes to the indoor skating rink. I learned how to say stop in Korean, I used it on two students who were walking behind me, it worked, but I can’t remember it now. Starts with a g sound. To my ears, it’s a g sound, but really the sound is somewhere between g and k, somewhere between and lost to my ears, not at all tuned to this language. At the skating rink, I learned a few more Korean words and I practiced a phrase I learned the day before, all while sipping cha. I like cha, especially in the fall and winter, and I’m supposed to be able to say that, that being I like cha, in Korean, but I can’t remember the English spelling, I can’t visualize the English equivalent, those words that look all mixed together, words not really words but letters that represent sounds, sounds that if not produced exactly how Koreans produce them will take you to the wrong destination while in a taxi, or to a blank look on your Korean friend’s face, leaving her saying, What? What? It’s baffling sometimes, this language, being here, walking thirty minutes with hundreds of students to an ice skating rink, but as you can see, my days still end in something that I would call pleasant, even when most of it was spent in a haze, me trying to adapt, adapting. 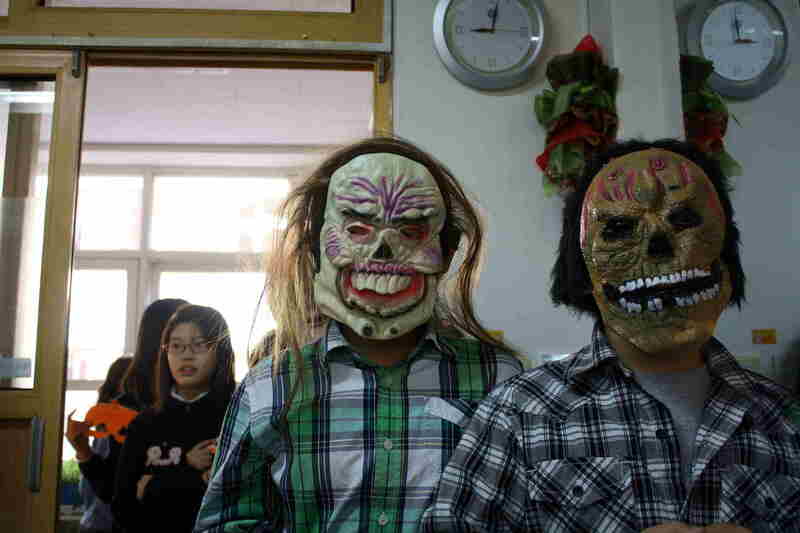 To say that Korea doesn’t celebrate Halloween is not quite right. A week before October 31 I was in Seoul and I saw two Korean girls in costume, one was the devil (or the devil’s daughter, as some of my students said) and the other was simply wearing a blue wig, the hair cropped mid-neck. They knew about Halloween, though, and some of my students (and now all of my students know) knew about it, too. Foreign teachers, like myself, teach them, mostly at the academies or hogwons, which is a Korean word, they attend after school. Maybe that’s obvious, but it hadn’t crossed my mind last Monday when I walked into class to find some students in costume and hitting me with all kind of spooky knowledge about this strange holiday. Not only that, but some were even asking really good questions – such as, Who started Halloween? – which I wasn’t able to answer. Most of them, though, just wanted candy, and on October 31, I gave it to them. The day before, I went to E-Mart and spent somewhere around 100,000 w on it*. I dragged five bags a couple blocks, then took a taxi the rest of the way. Halloween morning, I dragged it all back to my school, which is ten minutes from my apartment, walking the whole way. The kids didn’t mob me, but at one point during the middle of the day they were lined up the length of half the hall (and my school’s halls are long). I only gave each student one piece of candy, for fear of running out, but I ended up with a huge box full leftover. I plan to sell the candy, piece by piece, to my students for 5 Eric Teacher dollars, currency with my picture on each bill, currently in mass production. As for my personal Halloween night celebration, I decided to stay home and introduce a couple more family-oriented traditions to one of my Korean friends. We carved a pumpkin into a jack-o-lantern, complete with eyebrows and freckles that were made with a chopstick, and roasted the seeds in a frying pan, which actually worked quite well. Jack’s got such a stupid grin in his face but he kept us warm and safe, warding off the devil’s daughter, till the early morning. I doubt very much that I’ve had this much fun during Halloween since I was a child myself. *In Korean, you would say sip maan won, sip (pronounced ‘sheep’) is 10 in the Sino-Chinese number system, maan means 10,000, and won is comparable to the word dollar.